Rich Chicks Whole Grain Breaded CN Labeled products will win over even your pickiest critics. Simplify your next menu with our Whole Grain Breaded Chicken Nuggets, they’re easy, fun, and delicious and fit almost any menu idea. Made from high quality ingredients you recognize and trust (and can pronounce). Heat, serve and smile. Rich Chicks, unrivaled quality, Rich in Flavor, Rich in Nutrition. 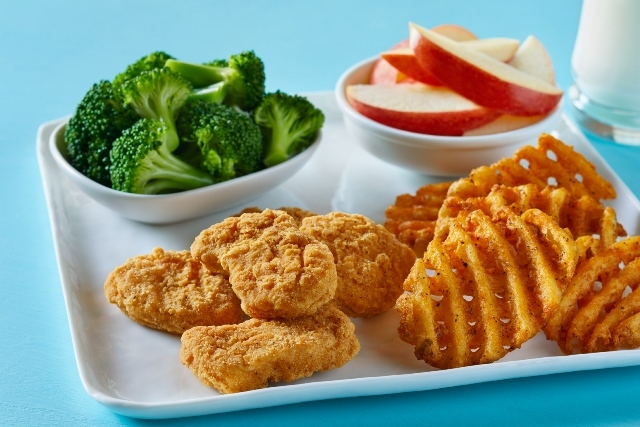 Simplify your next meal with Rich Chicks Supreme Gourmet Whole Grain Breaded Chicken Nuggets. Nuggets, Fries, Fresh Veggies and Apple Wedges. Done! Build, enjoy, repeat. Rich Chicks, it’s what’s for lunch or dinner or whenever!